A new one for a new day. Happy Veteran's Day. May all our Vet's be blessed. Good morning. I'm up too early. But I can always nap later. Does anyone have any plans for this Veteran's Day? Here is a photo of my Daddy, who is now in Heaven. 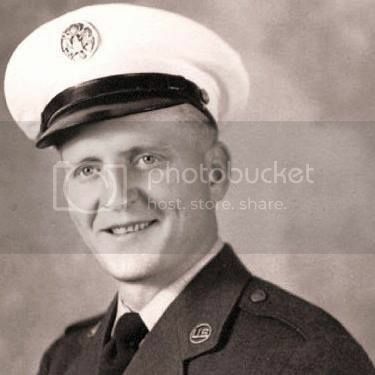 He served in WWII in the Marines, and in the Air Force after the war. Happy Veteran's day to all that did serve and to those still serving ! This country would not be what it is w/o them !! Hello all. Good to see dodge. Hope she can stay logged in. I have that same problem on another forum so I can feel her aggravation. After a while you just give up. We are in desperate need of rain. 18 fires in the mountains. As far as plans today, I was off work today but didn't do anything. Johnny worked a little bit. We ate dinner at Panera Bread. Are those nation wide? Yesterday I went on a field trip with the 3rd grade at Aubry's school. It was an all day walking tour. Weather was beautiful and we had a blast. Is powder puff a southern thing then because I went to 11th and 12th grade in NC and we played powder puff and both my girls did in high school. Last edited by Bestofour; Nov 11th, 2016 at 07:49 PM. I had just never heard of powder puff before.But they seem to have them a lot of places. Yes, Panera Bread is in California too. as noted, we are headed to Cabela's today. It is a beautiful day for an outing...I will hope he feeds me. in other news & notes, I think he "shared" his cold...I am hoping I am mistaken. I hope you are not getting a cold, Carol. Have fun at Cabela's. We don't have any of those here. Today I'll go to the bank and to the store. I'm not sure what else I'll do with my day. But something will get accomplished.I hope everyone has a great one. Hi all, GG had a Remembrance Day celebration at school on Thursday...we watched the ceremonies on TV yesterday as well. Grandboy had a sleep over here as well. Any chance of any of you wanting to go get some groceries for me? I would love to get groceries for you, Sunny. However, it looks like I may not be getting any for myself either. The sun is pooling on my napping sofa and it is inviting me to join it. Tina, I think it is nap time here as well. I did go shopping...wish someone else would pay for it though . I picked up my X-mas baking supplies as well. Each year I bake less and less...people don't visit like they used to over the holidays anymore. Hoping your naps went well. My nap went well..1-1/2 hours...it was glorious. We finally had dinner/supper. We were not hungry so we finally ate some left-over spaghetti that I had...I love not having to work on a Saturday.. Sounds as good as what I had for dinner tonight, cereal with a plum to go along. or perhaps pop corn....but as it is, Rod likes his meals.....so I was lucky tonight. I am soon going to sleep. sweet dreams to you all. Yes, I am lucky to mostly have myself to feed. Teddy eats his own thing and Jonni fixes what she likes and washes her own dishes. I hope to be able to see the super moon this week. It is supposed to be spectacular. I tend to miss them because I turn into a mindless person, dragging myself to bed in the evenings. I go to bed early as well Tina. GG and I just took apart and put away her trampoline...our yard is now Winter ready. I am hoping that tomorrow we get the Christmas lights up as well...they won't get plugged in until December but it is supposed to be a milder day tomorrow. I hate freezing my hands dealing with outdoor decor. It is supposed to be nearing 90* tomorrow but I still don't want to put up lights. I don't envy you. But I do admire you. 90*F......oh my how I envy you. Not that I necessarily like 90..but I know what we are headed for here (a bad winter is predicted) and I do not like that idea. We will only have one more hot day and then cool down to our normal 70 something. I like it. Sweet dreams my friends. It's close to bed o'clock. I would take the 70's....that sounds wonderful to me. sweet dreams to everyone. I am soon off to bed. It was cloudy here last night but I hope some of you got to see the moon at least. I had to sign up on Ebay for DH to get a new flip phone, I hope it all goes well....I don't like online shopping. He broke his phone and needs a new one for work next week. We can't get flip phones here anymore. I totally forgot to look for the moon! Good morning. Happy Monday. I'm going out to shop for a few items today. And then do some Christmas shopping on line. Sunny--as far as paying online, I use pay pal credit on e-bay....it is wonderful. The seller gets their money from Pay Pal and then they send you a bill in the mail. so, no personal information there out on the internet. and unless you allow it to be otherwise, you have to sign in to pay pal each time you pay so no info there either. I do not have a flip phone, BUT it is just a plain phone, so there are others options w/o getting a smart phone. I should have used DD's paypal...never even thought of that. DH's place of work is hard on phones so this time we ordered a 'rugged flip phone'...refurbished as well to save 75% of the cost. I just got in from putting up Xmas lights...I am down to two sets so I just zigzag'd them into an ornamental crab tree. I really need new ones and that was the plan last year but every brand was on the recall list. Hoping to get some on sale at the end of the season for next year. GG and I are going 'tipping' in a few to get branches to make our wreath. Sweet dreams all. I am off to bed soon. Thanks much, Tina....That was really interesting reading. Today we are going to see Grandboy after school. I bet you had a lot of fun driving through the mud puddles, Sunny. Making good memories for GG. I will go out today for some milk and bread and things. And other than that I will see what the day brings. I got back from shopping this morning and found a couple of stray dogs visiting. A male and a female, full grown dobies. They weren't shy at all but neither were they overly friendly. I had a hard time keeping Teddy out of their faces. They are probably visiting the neighbors. My excitement for the day. Sounds like you had an eventful day too Tina. Glad you were able to keep Teddy away form the Dobermans. I went to ceramics.....and I changed over closets for Rod & I. That is a job as I have to go up & down the basement stairs....a LOT. but all that aside...it is supposed to be a beautiful day today.....I hope all that have the same type of day enjoy it to it's fullest !! Good morning. I hope your leg cramps ease up, Carol. Statins scare me. Today is general house cleaning. At least I am going to make the attempt. Maybe some laundry as well. Fingers crossed. I did get some things done around here. No laundry but that will be OK on another day.